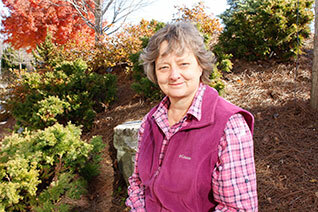 Julie Evans joined The Fockele Garden Company in 2000 and became a partner in 2005. She has helped guide the company’s development into an award winning design-build-maintain firm that offers a wide variety of services consistent with our commitment to good stewardship. She has 25 years experience in the green industry, and has held positions as a horticulturist at the Atlanta History Center, Sales Manager at Saul Nurseries, Inc., and owner of her own design-build company. Julie earned a B.S. degree in Natural Resources from The University of the South in 1984, and an M.A. in Biogeography from the University of Georgia in 1994. She has attended numerous technical trainings in ecological restoration, is a certified Wetland Delineator, and has been certified as a Green Roof Professional by Green Roofs for Healthy Cities. As a founding member of the Georgia Perennial Plant Association in the mid-eighties, she began what has become a long-term fascination with plant communities, as well as an individual plant’s place in both the natural world and the cultivated landscape. She has developed a particular interest in using ecological principles and proper plant selection to develop planting designs that can solve problems on challenging sites, such as storm water runoff, erosion, degraded soils and extreme growing conditions. Julie’s design work reflects the company’s natural style and its philosophy that gardens and landscapes can be both beautiful and environmentally responsible, which is mainly a matter of substantially reduced commitments of labor, water, and other resources.